US Powerball is an American lottery game sold by 47 lotteries including 44 states and District of Columbia, Puerto Rico and the U.S Virgin Islands, as a shared jackpot game. The draw happens twice a week every Wednesday and Saturday evenings at 10:59pm Eastern time. The jackpot prize starts at $40 million and rolls over to the next draw when no one wins the jackpot. The biggest US Powerball jackpot to date was $590,500,000 won by one ticket from Florida in May 2013. To win the jackpot, your ticket must match the 5 main numbers and 1 Powerball drawn by the Powerball lottery officials. Select 5 main numbers from selection of 1 to 69 and 1 Powerball from 1 to 26. You can also use “Lucky Pick”, our random number generator to choose for you. "Once you placed an order with us, you will receive your OneLotto official ticket(s), which can then be viewed within your “My Account“ page. There are total of 9 prize categories offered when playing US Powerball. To win the most coveted jackpot prize, your ticket must match the 5 main numbers and 1 Powerball. 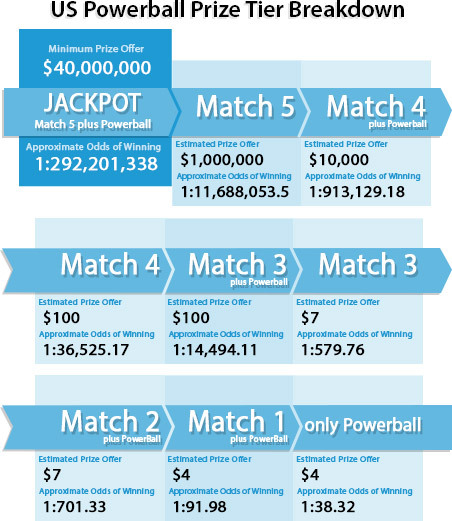 The table below shows the full breakdown of US Powerball winning prize tiers including the approximate odds of winning and estimated prize amount. The jackpot prize rolls over to the following draw in case there is no jackpot winner.